A senior Japanese embassy official reaffirmed Thursday that Tokyo wants to resume top-level shuttle diplomacy with South Korea "as soon as possible," saying that it is a symbolic step that would help enhance mutual trust between the two neighbors. Koichi Mizushima, minister and deputy chief of Japan's Embassy in Seoul, hoped that a summit involving the leaders of South Korea, Japan and China will also be held to discuss pending regional and global issues. "Shuttle diplomacy has an important and symbolic meaning in that it could help enhance trust between leaders of the two countries and show the trust to their people," he told a forum in Seoul. "We hope to resume it as soon as possible." 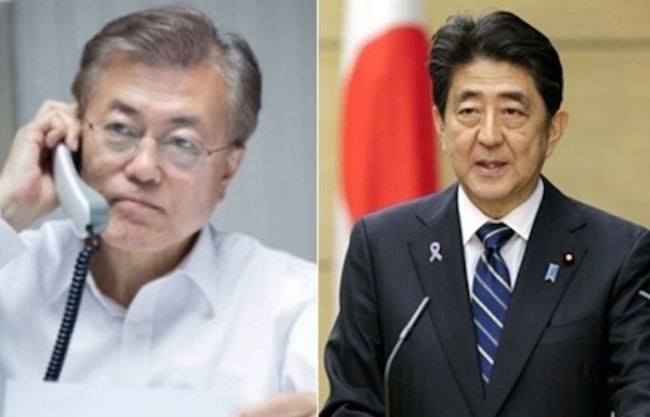 South Korean President Moon Jae-in and Japanese Prime Minister Shinzo Abe agreed in a July summit in Germany to resume shuttle diplomacy and hold a trilateral summit also involving China. The leaders of South Korea and Japan have not visited each other since the early 2010s as their ties chilled. The three-way summit has been suspended since 2015 due to long-standing historical and territorial feuds. Seoul and Tokyo have seen their ties bruised often in recent years by their repeated diplomatic frictions over atrocities done by Japan during its colonial rule of the Korean Peninsula from 1910-1945. They include a controversial deal reached in 2015 to leave behind Tokyo's wartime sexual slavery of many Korean women. In December 2015, they reached the deal under which they agreed to "finally and irreversibly" resolve the comfort women issue. Tokyo gave an apology for its colonial-era atrocities and agreed to contribute 1 billion yen (US$8.9 million) to a foundation dedicated to supporting the victims. The Moon government, which took office in May, has said that there appears to be procedural problems in reaching the deal. A task force is currently reviewing the process by which the deal was made and is to provide its assessment on the matter to the government by the end of this month. Mizushima admitted that there are some "sensitive" matters lingering between the two countries but noted that it would be better to deal with them without turning them into political and diplomatic issues. He added that it would be of no help both to South Korea and Japan if they turn their backs on each other, saying that they, instead, should seek "future-oriented" relations going forward. Saying that diplomacy is all about people-to-people relations, he underlined the importance of expanding exchanges of people, in particular, between younger generations in a way that they deepen the understanding of each other.